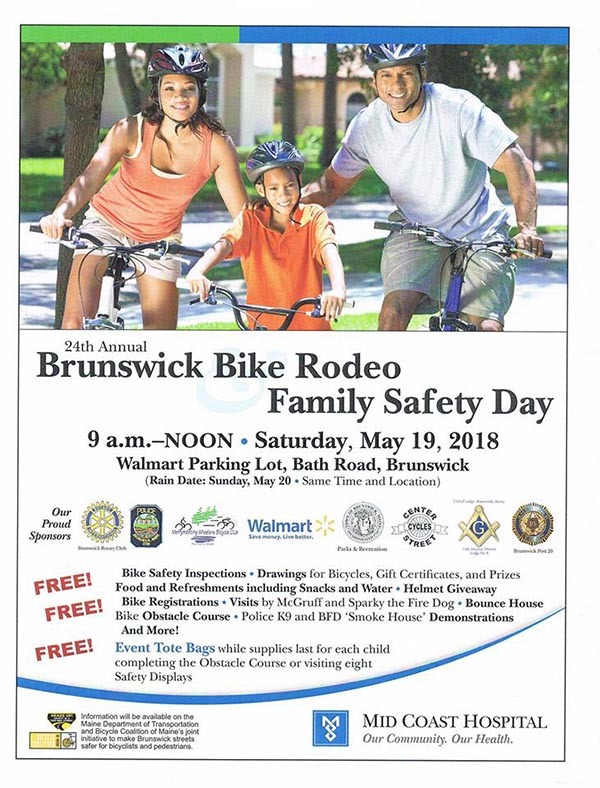 The Rotary Club of Brunswick is happy to announce the 2018 Brunswick Bike Rodeo & Family Safety Day will be held on Saturday, May 19 from 9:00 a.m. until noon in the Walmart parking lot, Bath Road in Brunswick. The rain date will be Sunday, May 20 at the same time and location. Attendees can expect a large number of free perks and activities at this year’s event, including bike safety inspections, drawings, snacks, water, helmets, bike registrations, a bounce house, a bicycle obstacle course and more. Visits by McGruff and Sparky the Fire Dog are expected, and there will be demonstrations by the Brunswick Police K9 unit and the Brunswick Fire Department’s “Smoke House.” Additionally, each child completing the obstacle course and/or visiting eight safety displays will receive a free event tote bag while supplies last. This event is fun and educational for the entire family. This year’s sponsors and participants include: the Brunswick Rotary Club, the Brunswick Police Department, the Merrymeeting Wheelers Bicycle Club, Walmart, Town of Brunswick Parks & Recreation Department, Center Street Cycles, the Brunswick Masonic Lodge, the Brunswick American Legion Post and Mid Coast Hospital.